Calistoga beauty. Photo via Calistoga Wine Growers’ Facebook page. A few wine events for you to consider, winos. Thursday July 20th is Calistoga Uncorked at The Presidio at the Presidio’s Golden Gate Club (5:30pm-7:30pm), featuring limited-production, reserve wines from 30 family-owned cellars from the Calistoga AVA (most don’t have tasting room and/or aren’t open to the public). 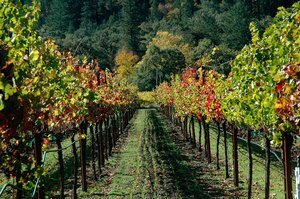 Calistoga Uncorked offers a chance to explore rare and little-known wines, and also buy wines on the spot to bring home. $55 in advance, $75 at the door. Monday July 24th is a Slow Food event welcoming the Consortium del Sannio (from Campania, Italy) to America for the first time. Falanghina del Sannio in the casa! There are classes, tastings, and more (check out the amazing chef lineup!) running from 1pm-8:30pm, details here. $50 donation includes food, wine, and dessert, all unlimited, as well as lectures on the wines and seafood sustainability in California (all proceeds benefit Slow Food San Francisco and the Salmon Restoration Project). Held at the Ferry Building Port Commission Hearing Room and Emporio Rulli Union Square. Have you bought your tickets to Outside Lands yet? (A limited number of single day and three-day tickets are still available!) To pair with Solange and Little Dragon will be this year’s Cocktail Magic, featuring 12 craft cocktails from Alembic, Homestead, Horsefeather, Pacific Cocktail Haven, Trou Normand, and Whitechapel. David Korins Design, the set designers for Broadway’s Hamilton, are behind the neon bars and décor. Cheers.